"Recurring eMails" means that after sent an email successfully, you want to send it again, or more times. In AMSSE, we also call it as “Repeat Sending”. For manual email sending, it does not make any sense, because you can simply click the “Send” button or link to do send the recurring email. But for the automatic email sending, it looks like a nice feature – do the repeat sending automatically! 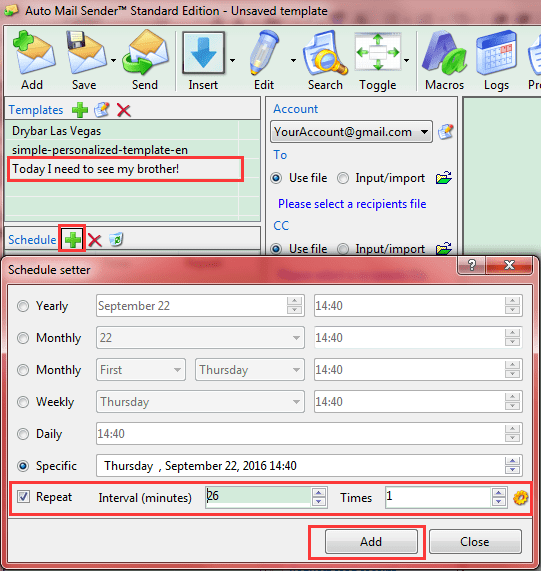 Screenshot 1: how to send timed emails? Schedule it in AMSSE. That is: select the template which you want to schedule sending, click the plus icon of the Schedule area, specify the sending time and repeat interval & times, and then click <Add> button to enable this repeat settings for the selected template. Screenshot 2: how to send timed emails? You can do it in AMSSE, even with the repeat sending settings. In AMSSE, the queue means that the waiting to send emails, then are generated follow your email schedules. 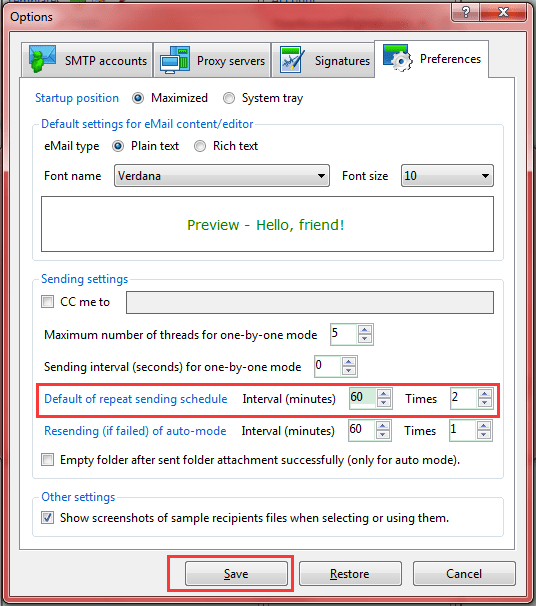 Screenshot 3: how to send timed emails? The timed emails will be automatically sent out in AMSSE. Usually, there is no data, because when you see it, current waiting email already sent out. AMSSE will log the sent out emails and you can see them on the Logs interface (click <Logs> button on the toolbar to open it). 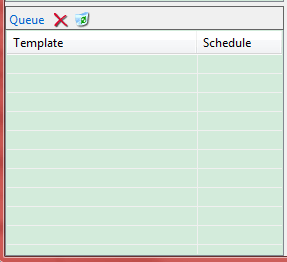 But if above queue list has data, you can see the concrete template name and scheduled time. And you can remove the unwanted queue or clear all queue items by using the picture buttons in this area. Download AMSSE to Send Scheduled eMail with Repeat Sendings!